Why are more and more couples struggling to get pregnant? The idea that women and men are simply waiting till later in life to start trying may be a scape-goat explanation. The emerging idea is that there are many factors creating the fertility struggle. The toxins in our environment, the overabundance of processed foods, and the stressors of day to day life take their toll on our bodies. Since the reproductive system is non-essential to our personal survival, it is an easy system for our bodies to put on the back-burner while it tries to survive in our challenging world. 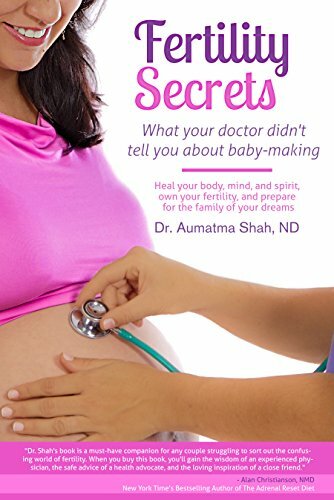 In Fertility Secrets: What your Doctor didn't tell you about Baby-Making, Dr. Aumatma provides a pioneering plan for optimal fertility. In her 10 years of practice, she has created an integrative and holistic approach for getting to the root of the inability to conceive and how to resolve it in a holistic way, helping to create more balance and fertility in the body. What can you expect from this book? • And... The three-step Fertility Success Method proven to support your body's vitality so that you can get fertile, stay fertile, and have a baby when you choose! Dr. Aumatma Shah, Naturopathic & Holistic Fertility Doctor, and the creator of the Fertility Success Method-- a step-by-step method to help create health, vitality, and hormone balance in order to ease-fully reverse the symptoms of infertility, an imbalance that is becoming one of the country’s fastest growing problems. One in eight couples between the ages of 18 and 35 currently suffer from infertility— a disease that often has multiple root causes that are difficult to identify. Fertility Secrets: What your Doctor didn't tell you about Baby-Making is the first book to offer a proven protocol by an acknowledged expert in the field to treat this condition and help couples have the family of their dreams.